Survivor Jennifer ‘Jenni’ Rowell underwent surgery on April 8, 2013 to remove Mucoepidermoid carcinoma cancer which caused her to lose the following: upper right jaw, right base of her skull, the upper third of the trapezius, right jugular vein in the neck, and a facial nerve that caused partial facial paralysis. Mucoepidermoid carcinoma is a rare form of cancer that affects the salivary glands and can spread to other organs. This type of cancer can appear in smokers of which Jenni is not, which partially inspired the name of her upcoming documentary Some People Are Just Unlucky. When she awoke from her surgery and saw the dramatic change from the woman she knew to an altered version she was in understandable shock, yet she posted a photo of herself on Facebook with the caption: I AM ALIVE. s ensued when she was laid off from her job right before her surgery. Although she had some assistance from COBRA, her hospital and post- surgery costs (doctor appointments, physical therapy, speech therapy etc.) still amount up to over $100k. This would be the point where anyone would throw their hands up and give up. Not Jenni. She created a GoFundMe campaign with a $3600 goal that raised $4750 in just one week! She has since had to raise the goal to $20k due to extra expenses; additionally she launched another fundraising effort Beat Cancer With Jenni that sells t-shirts as seen above. 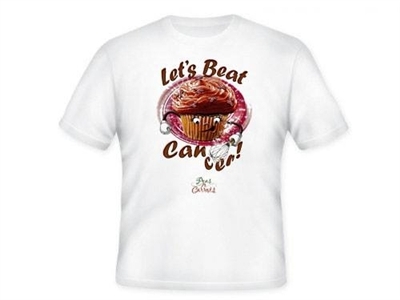 The t-shirts combined her love for life, making baked goods, and surviving cancer into the design of her t-shirts that come in sizes small- 3XL and a variety of colors. At 32 years old Jenni is a beacon of survival and looks forward to continuing to live her life off the wall one day at a time. We encourage you to support this survivor by purchasing her t-shirts and sending us a picture of you in it with a special message for Jenni. The photos will be tagged and shared through our networks. Please send your photos to msnixads@gmail.com or our Facebook page. Jennifer’s full testimony of her survival can be seen on Breath of Life Daily.